A horrifying video of a puppy being fed to a python is circulating online with many social media users expressing outrage over the incident. The video originated on Chinese social network Weibo, stunning the site’s users and prompting them to call for the person responsible to be punished. It soon spread to Twitter, generating horrified responses from those who clicked into the footage. Someone just shared a video on Facebook of a python about to eat a puppy. I'm deleting my account. The person who made the video of a damn Python eating a puppy; satan is waiting for you. 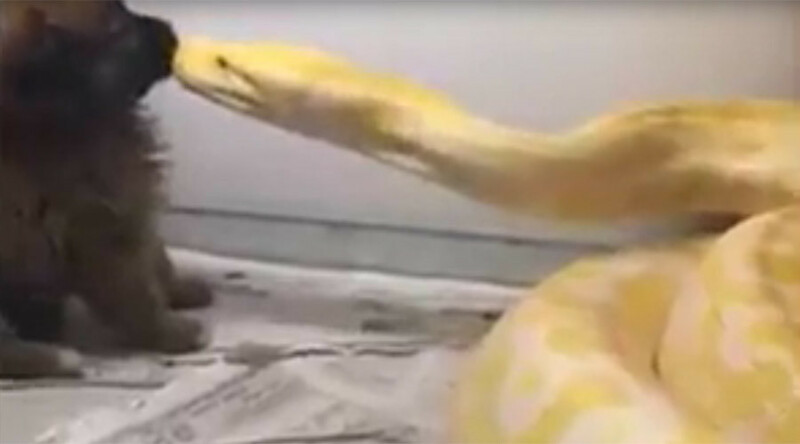 Disturbed viewers across the globe have been condemning the footage and many are calling for the golden python’s owner to be prosecuted for animal cruelty. Although only six seconds in length, the video is long enough to anger animal lovers. The footage cuts off before the puppy is eaten on camera, however the short recording shows the python grabbing the small brown puppy by its face before coiling its body around the tiny canine. I just watched a video of a python eating a little puppy. Needless to say I am crying my eyeballs out. Feeding a dog to the python is a crime in China, according to Xie Yan, an Associate Professor of Zoology in the Chinese Academy of Sciences who spoke to Sina.com. China heavily regulates the import and export of golden pythons. Owners who want to keep the snake as a pet need individual approval from the State Forestry Administration.